Arsenal star Aaron Ramsey was once again in fine form as Arsenal beat Norwich City on Saturday to continue their Champions League qualification battle. The Gunners got back to winning ways on Saturday as a goal from Danny Welbeck saw them to 1-0 win over the Canaries at the Emirates Stadium. 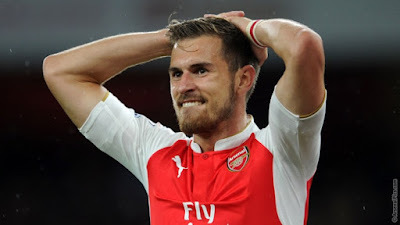 Ramsey was once again handed a central midfield role alongside Mohamed Elneny, fighting off competition from the returning Jack Wilshere and Francis Coquelin. He fully justified his selection though as he posted a number of impressive stats throughout the game, both offensively and defensively. He managed 117 touches in the game, the most of any player, with just three of those proving unsuccessful. Defensively he was solid, posting two won tackles and four defensive duels in total. His recovery of the ball was notable though, winning possession in midfield seven times, the most of any player, and recovering the ball nine times. His passing was at its usual high level, as he managed 90 accurate passes in total , 33 of which were in the final third, and the Arsenal star enjoyed an overall pass success rate of 88% in what was another top performance.